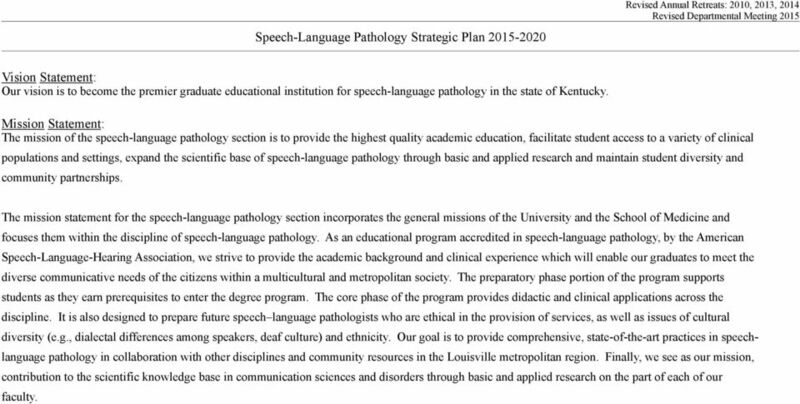 Download "Speech-Language Pathology Strategic Plan 2015-2020"
1 Speech-Language Pathology Strategic Plan Vision Statement: Our vision is to become the premier graduate educational institution for speech-language pathology in the state of Kentucky. Mission Statement: The mission of the speech-language pathology section is to provide the highest quality academic education, facilitate student access to a variety of clinical populations and settings, expand the scientific base of speech-language pathology through basic and applied research and maintain student diversity and community partnerships. The mission statement for the speech-language pathology section incorporates the general missions of the University and the School of Medicine and focuses them within the discipline of speech-language pathology. As an educational program accredited in speech-language pathology, by the American Speech-Language-Hearing Association, we strive to provide the academic background and clinical experience which will enable our graduates to meet the diverse communicative needs of the citizens within a multicultural and metropolitan society. The preparatory phase portion of the program supports students as they earn prerequisites to enter the degree program. The core phase of the program provides didactic and clinical applications across the discipline. It is also designed to prepare future speech language pathologists who are ethical in the provision of services, as well as issues of cultural diversity (e.g., dialectal differences among speakers, deaf culture) and ethnicity. Our goal is to provide comprehensive, state-of-the-art practices in speechlanguage pathology in collaboration with other disciplines and community resources in the Louisville metropolitan region. Finally, we see as our mission, contribution to the scientific knowledge base in communication sciences and disorders through basic and applied research on the part of each of our faculty. 2 Focus Area I: Clinical Preparation of Students The forced closure of the Myers Hall Speech-Language Clinic due to budgetary constraints had the potential to negatively impact new core students clinical preparation, which in turn had the potential to jeopardize future, fulltime placements. Outcomes: 1. Earn initial clinical hours in a supervised, part-time clinical setting. 2. Earn clinical competencies needed for the skills portion of the KASA. Long-Term Goal #2: 1. Students will earn a minimum of 25 initial hours per semester. In 2009, students earned an average of clinical hours in the spring semester placement in our community partnership with Jefferson County Public Schools. Therefore in 2011, initial placements were reduced from two semesters to one semester, because students earned approximately 25 hours or more in one semester. Goal Met (2011) 2. In 2009, students earned more than five competencies in the spring semester placement in our community partnership with Jefferson County Public Schools. (a) However, once the faculty determined that it was more optimal to have the initial student hour placement one semester, the faculty determined that this outcome was no longer appropriate. A review of graduating students competencies supported the decision to drop the expectation for competencies from the initial 25 hours. Due to the reduction to a single semester, students now receive clinical competencies from this placement only under exceptional circumstances, as approved by the Clinic Director. Goal Met (2009) (b) In 2013, practical labs and standardized patient experiences were introduced into multiple courses to increase students ability to obtain clinical competencies in underrepresented patient populations. 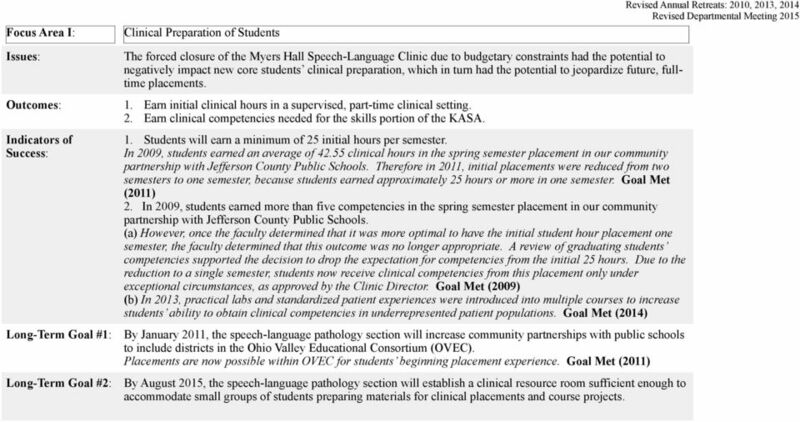 Goal Met (2014) By January 2011, the speech-language pathology section will increase community partnerships with public schools to include districts in the Ohio Valley Educational Consortium (OVEC). Placements are now possible within OVEC for students beginning placement experience. Goal Met (2011) By August 2015, the speech-language pathology section will establish a clinical resource room sufficient enough to accommodate small groups of students preparing materials for clinical placements and course projects. 4 Focus Area II: Continued Long-Term Goal #2: Long-Term Goal #3: Program Development By August 2017, the speech-language pathology section will establish formal partnerships with Jefferson County Public Schools as a part of the University of Louisville signature partnership in the west end of Louisville. By August 2016, the speech-language pathology section will fill a full-time faculty line whose area of expertise is adult organics, specifically voice and/or dysphagia. By August 2015, the speech-language pathology section will establish interdepartmental relationships to include teaching and/or research with otolaryngology and/or neurological surgery at the University of Louisville. 5 Focus Area III: Community Clinic The program has a commitment to meet the clinic needs in the community, by re-establishing the university training clinic. Steps to reopen the university training clinic were hampered by financial and physical location issues. Prior to June 2012, the program was in a building slated to be closed whenever a new location could be provided. It was not prudent to open a clinic without the assurance that the move would include clinical space. Updates: 1. In June 2012, the program was moved to a new location but the university did not provide any space for an onsite, clinical component. 2. Repeated investigations into obtaining Kentucky Medicaid certification for billing have not been successful. Kentucky Medicaid continues to restrict credentialing to rehabilitation settings where both medical and related therapies such as OT or PT are provided. Since we only offer speech-language therapy, and the majority of clients require Kentucky Medicaid assistance, we are unable to fund and staff and university training clinic. 3. With changes to Kentucky Medicaid, the program will continue to investigate various options. Outcomes and Long-Term Goal #2: 1. As of January 2015, independent SLPs in the state of Kentucky are eligible to bill Medicaid. By August 2016, the speech-language pathology section will investigate funding avenues through affiliation with Kentucky Medicaid to offer additional clinical opportunities to our students but also to fill a known gap in speech/language services to clientele in the community. By August 2017, the speech-language pathology section will pursue its commitment to meet the clinic needs of the community by pursuing a partnership with Jefferson County Public Schools consistent with Focus Area II. 6 Focus Area IV: Increase Educational Experiences (Graduate and Professional) The program regularly examines the graduate curriculum to ensure that the depth and breadth of courses reflect the changing demands of the profession. The faculty is committed to continue this practice, as well as to demonstrate leadership within the community, to reflect state and national (ASHA) standards in clinical care. Outcomes: 1. Review course progression and required courses for program on a biannual basis. 2. Encourage student participation in state and national conventions and locally sponsored ASHA CEU opportunities. Long-Term Goal #2: 1. The program program reviews courses regularly. The graduate course sequence reflects the most common curriculum needs for practicum placements by placing the majority of courses within the first year of the program. 2. Course schedules are adjusted to allow students to attend state and/or national conventions. Most students attend the state convention each year. Some students attend the national ASHA convention about every other year. There is partial assistance from the Graduate School to fund students attendance at the ASHA convention. 3. Students were excused to attend the regional course on Lee Silverman Voice Treatment in By March 2015, all first and second year graduate students will attend a research methodology seminar specific to communicative disorders sponsored by the speech-language pathology section. By August 2015, all incoming graduate students will be required to register for a graduate level course in research methodology. The approved course is ELFH 600 (Introduction to Research Methods and Statistics). ELFH 600 is offered as a face-to-face course; an online format is also available. 7 Focus Area V: Maintain Opportunities for Cultural Diversity The program will continue to maintain and expand opportunities for cultural diversity within the curriculum and practicum settings. Outcomes: 1. Infuse ethnic, economic, and cultural considerations into academic courses. 2. Maintain placements in school, hospital, and rehabilitation settings with diverse cultural, economic, and ethnic populations. 3. Improve recruitment efforts to obtain qualified applicants of diverse cultural, economic, and ethnic backgrounds for the graduate program. 1. Lectures, presentations, and research in each course reflect current understanding of the influence that cultural, economic, and ethnic factors bring to normal development as well as to assessment and treatment of various disorders. 2. Placements within the Kentuckiana region and rural areas in this and adjoining states reflect cultural, economic, and ethnic diversity. 3. The faculty recruited graduate students in the Arts and Sciences undergraduate programs at UofL (general assembly). The program will continue to accept the best qualified applicants, regardless of cultural, economic, or ethnic background. By August 2015, all students enrolled in CMDS 668 (Professional Issues in Speech-Language Pathology and Audiology) will be required to attend the Health Science Campus Cultural Competency Workshop (one-day seminar). 8 Focus Area VI: Provide Relevant Cutting-Edge Technology into Academic, Clinical, and Research Areas The program seeks to incorporate cutting-edge technology into academic, clinical, and research areas. Outcomes: 1. Maintain teaching practices which utilize cutting-edge technology. 2. Develop a laboratory with appropriate cutting-edge instrumentation. 3. Maintain practicum placements with cutting-edge instrumentation. 1. Courses will continue to utilize the possibilities within Blackboard to enhance teaching. Such options include course notes, discussion boards, Tegrity, wikis, blogs, and portfolios. 2. Students and faculty will begin to use outlets such as Google Docs to create shared space for presentations and on-going projects. 3. Students are utilizing the Computer Speech Lab (Kay Pentax) to access and analyze various types of speech and voice disorders. 4. Practicum placements utilizing cutting-edge instrumentation for dysphagia, aphasia, autism, AAC, and neonatal issues will be maintained and expanded. By August 2016, all graduate students will demonstrate proficiency utilizing the Computer Speech Lab (Kay Pentax) to assess and analyze various types of speech and voice disorders. Program Plan for Speech-Language Pathology Master s Program 2013 Program Goal 1 The provides students with comprehensive coursework in the discipline of speech-language pathology. group(s) will be assessed? Private Practice Owners and Co-owners For additional information, please contact Jeanette Janota, Surveys & Analysis American Speech-Language-Hearing Association Rockville, MD 20850 800-498-2071, ext. 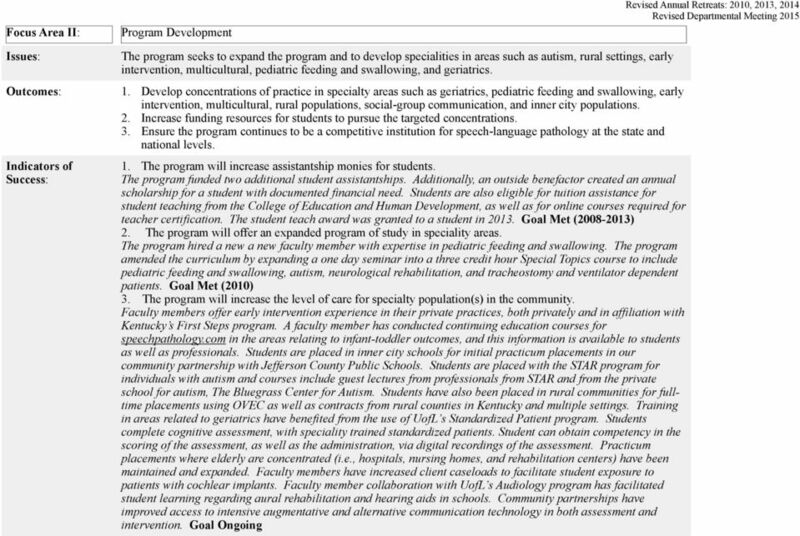 Proposed Graduate Program in Master of Science in Communication Disorders CIP 510203 Concept Paper Prepared by Amy J. Hadley, Ed.D. CCC-SLP, Assistant Professor, Speech Pathology and Audiology with Dr.